Not to sound like a broken record, but I’m tired today. I rested better last night than the night before, but sleep was still elusive. 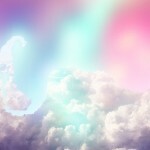 Fortunately, the issue with the prescription has been resolved, and shortly I will be floating in the fairy clouds pictured above enjoying a wonderful sleep. How are things going otherwise? Pretty well, I think. My right hand and forearm still hurt, and I’m still retaining water, but I’m hoping those things will dissipate now that I am not taking the steroid for a while. And I’m going to get this whole lack of sleep thing handled, so tomorrow should be good. I had one little issue though… yesterday they forgot to give me an injection to help boost my white cell counts. So I ran over during lunch and got the injection. And the injection has common side effects of making your bones ache, and you potentially run a fever, oh, and be alert for a severe allergic reaction… like if you can’t breathe, or pain that means your spleen is about to rupture but other than that, you’ll be fine. Apparently they took it seriously when I walked in and said, Okay, I’m here so you can torture me some more.. But *crosses fingers* so far, so good. I don’t really have any more than that for tonight (and yes, I heard that collective sigh of relief) because I have things I want to talk about, but my brain is mush from being sleep-deprived, so we could travel into the realm of the ridiculous if I allowed my brain to lead the way here. A big shout out to my sister, Dana for her birthday. I remember this day those years ago like it was yesterday. I knew someone special would be arriving, and I was right. Hope you had a great day. Yay for being back to work – even virtually. I tend to agree that a sense of normalcy is so important when everything in your life seems to have gone so incredibly abnormal. So yay! Those white cell boosts are important and I’m sure it’s pretty rare for someone’s spleen to go kaplooey but nothing like putting the fear of God into you anyway right? Take some of those happy sleepy time pills and give your brain and your body some much needed and earned rest.